Neil McCallum, born October 3rd, 1934, passed away on Sunday, December 23rd, 2018. Neil is survived by his wife of 61 years, Anna; children: Kirk (Vera) McCallum, Lori (Ron) Lancaster, and Sean (Lisa) McCallum; grandchildren: Kristopher, Katrina, Jennifer, Tyler, Jamie, and Philip; and great-grandchildren: Layla, Aurora, Mason, Tristan, Scarlett, and Jax. Neil served in the RCAF before opening Pleasant Valley Kennels with his wife Anna in Moose Jaw, SK. Neil and Anna then moved to Kelowna for many years before returning to Moose Jaw. Neil loved travelling and spent many winters in Yuma with Anna. The family would like to thank the staff of Providence Place for their excellent and compassionate care of Neil. A Memorial Service will be held on Saturday, January 19th, 2019 at 11:00 a.m. in Moose Jaw Funeral Home. Father George Thattuparampil will officiate and interment will take place at Moose Jaw Indoor Columbarium. As an expression of sympathy, donations in Neil’s name may be made to the Alzheimer Association of Saskatchewan, 301 – 2550–12th Ave, Regina, SK S4P 3X1. Arrangements are entrusted to Moose Jaw Funeral Home, 268 Mulberry Lane. 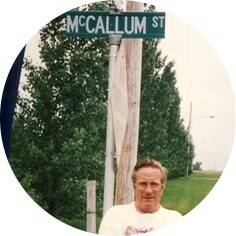 Gary McDowell, Funeral Director 306-693-4550. Anna and Family – I am so sorry to hear of Neil’s passing. He was a real sweetheart and will be sadly missed. Sincere condolences. So sorry for your loss, I have so many wonderful memories of my time together with you, Neil & your family. So sorry to hear about your father’s passing Lori and Ron. Our thoughts and prayers are with you at this time. God bless. It truly was a honour to know Neil. He and ANNA were so sweet together. He was so very proud of all of you. He would always tell me stories about all of you. Anna, so sorry to hear of Neils’ passing. Sincere condolences to you and the family. Oh, I am so sorry to hear this. What a great photo of him, handsome and kind. I have many memories of him, your mum and your family. I am truly saddened to learn this and so sorry for your loss. Love to you all.